Western blot analysis of extracts from 293 cells, untreated or UV-treated (100 mJ, 4 hr recovery), using Phospho-ATM (Ser1981) (D6H9) Rabbit mAb (upper) or ATM (D2E2) Rabbit mAb #2873 (lower). 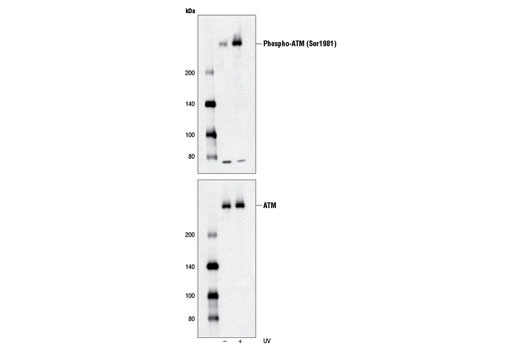 Phospho-ATM (Ser1981) (D6H9) Rabbit mAb recognizes endogenous levels of ATM protein only when phosphorylated at Ser1981. Monoclonal antibody is produced by immunizing animals with a synthetic peptide corresponding to residues surrounding Ser1981 of human ATM protein. Ataxia telangiectasia mutated kinase (ATM) is a serine/threonine kinase that regulates cell cycle checkpoints and DNA repair (1). Activation of ATM by autophosphorylation on Ser1981 occurs in response to exposed DNA double stranded breaks. ATM kinase regulates a number of proteins involved in cell cycle checkpoint control, apoptosis, and DNA repair. Known substrates include p53, Chk2, Chk1, CtIP, 4E-BP1, BRCA1, RPA3, H2A.X, SMC1, FANCD2, Rad17, Artemis, Nbs1, and the I-2 regulatory subunit of PP1 (1,2). Mutations in the corresponding ATM gene result in ataxia telangiectasia (AT), an autosomal recessive disease characterized by uncoordinated muscle movement and neurodegeneration. Cells from AT patients display defective DNA damage-induced checkpoint activation, sensitivity to radiation, and a higher frequency of chromosome breakage (3,4). Lee, J.H. and Paull, T.T. (2007) Oncogene 26, 7741-8. Tang, X. et al. (2008) Mol Cell Biol 28, 2559-66. Shiloh, Y. (1997) Annu Rev Genet 31, 635-62. Petrini, J.H. (2000) Curr Opin Cell Biol 12, 293-6.